THERE was disappointment and frustration at Dry Leas on Saturday as Henley Hawks slipped to their second defeat of the season at the hands of Tonbridge Juddians. The Hawks will be disappointed that they couldn’t produce a performance to match those in the first two weeks of the season. Their performance was littered with unforced errors, which handed the initiative to the visitors who took their chances well. The match was played throughout in driving rain, particularly in the second half and it was the men from Kent who managed the conditions much more effectively, despite the Hawks winning the try count two to one. Henley started brightly, and despite an early missed penalty chance that would have put the Hawks in front, stand out forwards Dave Hyde and Alex Bradley excelled in taking the ball forward and driving powerfully to gain good ground for the home side. However, this was the only meaningful visit by the Hawks into the Tonbridge half for more than 20 minutes as the visitors began to take control. Mistakes started to creep into the Hawks game and dropped passes along with missed touch kicks handed the initiative to the visitors. The Hawks didn’t seem to get the rub of the green from the referee and they were guilty of offside twice in three minutes which gave ex-Hawk Will Robinson the chance to kick two penalties. Tonbridge increased their lead with their only try when a box kick from Henley scrum half Rory MacDougall was collected by the Juddians winger Hugo Watson who managed to run through a number of Henley defenders before a scissor pass enabled fellow wing Murray Galbraith-Lowe to touch down. Robinson converted. A further offside penalty was conceded by the Hawks and prop Rory Mason collected an unfortunate yellow card and Robinson made no mistake with the penalty to give the visitors a 16-0 lead. Tonbridge collected a yellow card of their own which gave the Hawks the opportunity to get within scoring distance. A line-out won by Dave Hyde gave the forwards the chance to drive at the visitors’ line with Connor Morrison and Bradley going close. A second line-out drive was illegally stopped by the Kent side and the referee had no choice but to award a penalty try to the Hawks. As the second half started, the rain had become much heavier. Tonbridge gained the initiative straight away and made good ground through their forwards as they adopted a ‘pick and go’ approach to attacking. Their ball recycling was much quicker than the Hawks and they almost increased their lead but for a great tackle from Henley wing Jack Robinson. Henley’s spirit, like the previous week, was good but just when it looked as though they could create something, they either lost possession or needlessly kicked the ball away when better options were available. The Hawks were then penalised for pulling a scrum down and Robinson increased the lead for Tonbridge. When the chance came, the Hawks back row of Sam Lunnon, Marcus Lowe and Alex Bradley continued to try and give the Hawks some attacking momentum. At this point with the visitors’ pack visibly tiring, good work in the front row from Dave Manning, Tom Emery and Rory Mason meant the Hawks scrum was in total control and a massive effort from the pack resulted in what looked like a shift in momentum in the game. Connor Morrison almost got over from a crash ball move. Simon Perry went close following another scrum close to the Tonbridge line before Alex Bradley crashed over for the try which Roddy Giles converted. Any thoughts of a Henley revival were dashed as Tonbridge gathered themselves together for the final few minutes. Despite a renewed vigour from the Henley side, the visitors kept the ball and kicked intelligently. They worked their way into Hawks territory and could have robbed the home side of the one bonus point they had earned but Robinson’s penalty came back off the post. The Hawks managed to disrupt a Tonbridge line-out towards the end but they couldn’t get out of their own half to threaten the scoreboard. 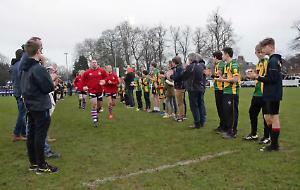 Henley Hawks: 15 Roddy Giles, 14 Jack Robinson (Finn Pietersen, 35 mins), 13 Connor Morrison, 12 Simon Perry, 11 Jack Antoniou (Adam Neale, 79 mins), 10 Joe Butler (Leo Webb, 55 mins), 9 Ross McDougall, 1 Dave Manning, 2 Tom Emery, 3 Rory Mason (George Primett, 79 mins), 4 Dave Hyde, 5 Jake Albon, 6 Sam Lunnon, 7 Marcus Lowe, 8 Alex Bradley. Replacement not used: Andrew Stobbs.